The story that was passed down to my mother was that the Parkinson family were "gentlemen farmers" from Cheshire. There was also a story about one of the Parkinsons being known locally as "Mad Parkinson" although we have no documentary knowledge or proof of this. What we can be sure of is that the Parkinson family resided in the village of Wrenbury and the nearby hamlet of Wrenbury Heath for a period of around 150 years from the middle of the 18th century to the end of the 19th. The first three generations were tenant farmers, cultivating land in Wrenbury Heath. However, the later generations were merely agricultural labourers and by the end of the 19th century there were no Parkinsons left in the village, all having moved elsewhere to find work. 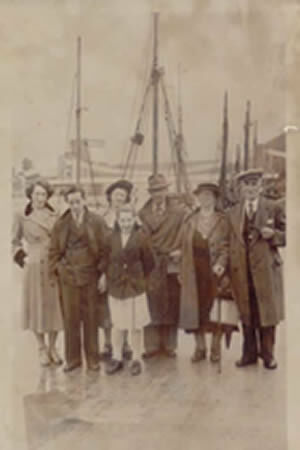 One line of the family moved to Crewe but the majority moved outside the area. The first Parkinson in the Wrenbury area was John Parkinson, who would appear to have moved to Wrenbury as a young man some time in the 1740s. It is not clear where he came from although the area around Market Drayton or Whitchurch is a possibility as there is some evidence of earlier Parkinson families in that area. The earliest documented evidence of a Parkinson family in Wrenbury are two burials recorded, that of Ann Parkinson (buried 1 July 1748) and Elizabeth Parkinson (buried 3 July 1751). Either of these could have been John's mother, but is most likely to be Ann this was the name of John's first daughter. John had two marriages. His first wife, Sarah, give birth to two children, Ann in 1758 and John in February 1761. Sarah, however, died giving birth to her second child and John subsequently married Mary, who had seven children of her own. These were Elizabeth (b.1763), Susannah (b. 1765) William (1766) Thomas (1769), Samuel (b. 1771), a second Thomas (1773), George (1777). John died in December 1796 and Mary in December 1799. Ann Parkinson (b. 1758) gave birth to a child, Sarah in December 1778. The child died when less than a week old and was buried on Dec 26th 1778. After this there is no further record of Ann. There is no record at all of John Parkinson other than his baptism in 1761, so he presumably survived. Elizabeth Parkinson (b. 1763) had a child outside of marriage called John born September 12th 1796 but he died in infancy and was buried on Christmas Day 1796, only 4 days after his grandfather, John. William Parkinson (b. 1766) died in May 1803 in Wrenbury. There is no evidence of him having had a wife or children. It is not known why there were two Thomas Parkinsons. However, a Thomas Parkinson was buried in Wrenbury on Sep 6, 1782. This may well have been the elder Thomas (b. 1769). There is no knowledge of what happened to Samuel Parkinson (b. 1771). There are no recorded deaths so he may have moved away. George Parkinson (b. 1777) was an earthenware dealer. He married Anne and had at least two children with her. He remained in the Wrenbury area at least until the 1830s (when he was living in a cottage in Wrenbury village). By 1841, however, he had moved to Nantwich. Thomas Parkinson (b. 1773 - my g.g.g.g.grandfather) would appear to have, at some point, taken over the family farming business from his father. He married Catherine (1768-1837) and together they had nine children - Mary (1791), Elizabeth (1794), Thomas (1796), John (1799), Ann (1801), William (1803), Samuel (1806 - my g.g.g.grandfather), James (1810) and Hannah (1812). 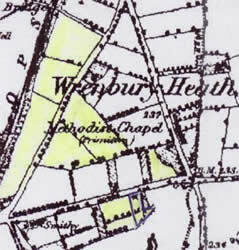 In 1841 Thomas was still farming land in Wrenbury Heath. 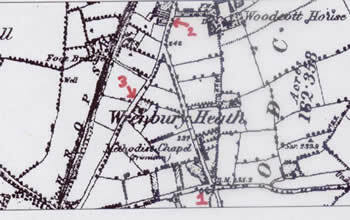 Tithe maps from the time show him renting a house and gardens on the South side of the road to Sound from landowners Maria Catherine Edgar and Mrs Hewitt (marked 1 on the map). He also rented two adjacent fields as well as six fields along the Wrenbury-Ravensmoor road from the same landowners plus a further field opposite his house from John Cross Starkey (the Starkey family were local landowners residing at Wrenbury Hall). The house no longer exists and indeed, the fields along the Sound road now have houses built on them. However, the fields on the Ravensmoor Road are still farmed. The fields farmed by Thomas are marked in yellow on the second map below. To link to the e-maps of the fields farmed by Thomas Parkinson, click on the maps. Two of Thomas's sons, Samuel and James lived in the vicinity. Samuel was renting a house and two fields a little further up the Ravensmoor road (marked 2 on the map), whilst James, having taken up a career as a shoemaker, was sharing a rented property with George and Thomas Nevett, also on the Ravensmoor road (marked 3 on the map). Although Samuel Parkinson certainly rented land at one point, he was, in the 1841 census, described merely as a labourer. Samuel married Mary Mulliner (b. 1811) and had ten children with her - John (b. 1833), Thomas (b. 1835 - my g.g.grandfather), Betty (b. 1836), William (b. 1838), Joseph (b. 1841), Samuel (b. 1843), Harriet (b. 1845), Mary (b. 1847), Emma (b. 1850) and Henry (b. 1852). Samuel's eldest son, John had three children with his wife Sarah but died relatively young, sometime between 1778 and 1881. Thomas, the second eldest (b. 1835), grew up to be an agricultural labourer. He married Elizabeth Williamson (b. 1834), who he would have known since they were very young children, as both Thomas and Elizabeth are listed as young children in the 1841 census living only two houses away from each other. In the 1871 census Thomas is listed as living with his father-in-law Samuel Williamson at 77 Wrenbury Heath. By 1881, however, he had moved to Baddiley, another small village a mile or two further up the Ravensmoor road. William (b. 1838) married Catherine (also born in Wrenbury) and had six children. Some of the offspring from this line of the family eventually moved to Crewe. Harriet (b. 1845) married Joseph Meredith Foxley, a railway platelayer and had two daughters, Mary and Elsie. More information on this line and a picture of Elsie can be found on the family history website of Harriet's g.g.grand-daughter, Barbara Ainscough. Henry Parkinson (b.1852) married Catherine Park and had son, Walter (b. 1893). Henry died in February 1905 from injuries sustained whilst working a circular saw (thanks are due to Henry's great-grand-daughter, Sheila Wilford for this information). My great-grandfather, Walter Parkinson was born in Wrenbury but moved to Bangor in North Wales in the 1880s to work on the railways. He married Edith Alice Gregson on July 16, 1892. In the 1901 census Walter is still living in Bangor when he was described as a Civil Engineers Clerk. By 1911 he had moved to Sarn Faban, Anglesey (Llanfair PG), when he is described as being a railway clerk. According to my mother, Walter eventually rose to become a station master, either at Bangor or Conway. Walter and Edith had 6 children, Ada (b. 1894), Bruce (b. 1897 - my grandfather), John (also known as Jack - b. 1900), Walter (b. 1904), Daisy (b. 1906) and May (who died in her childhood). Walter's wife, Edith was considered to be very strict and didn't get on with her daughter-in-law, Evies. She ran a guest house at some point during her life and after Walter's death she married a second time, to a Jack Jones. My Grandfather, Bruce (pictured right - in the centre of the photo), was a joiner. He married Evies Anna-Beer Ramsay and lived his adult life in the Manchester area. He died in the 1950s.